Brightwheel is the #1 software solution for schools, childcare, camps, and after school programs. Brightwheel lets you manage your center, streamline workflows, and engage with parents. 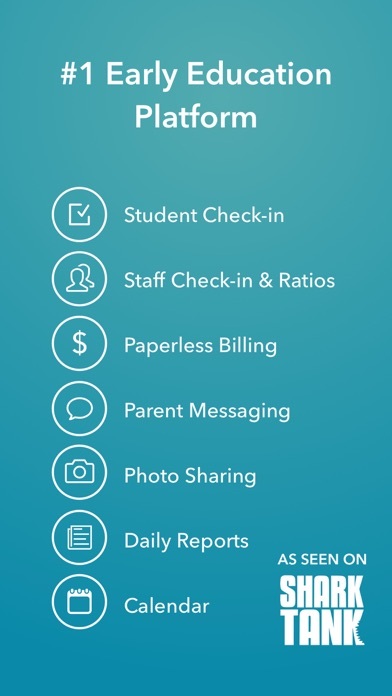 Brightwheel is the only app that integrates everything you need: sign in/out, messaging, assessments, daily reports, photos, videos, calendars, online bill pay for parents, and much more. Most importantly, brightwheel is proven to save you time and money, to make life easier for your staff, and to improve satisfaction for your parents. Join the thousands of programs across the globe that have fallen in love with brightwheel! 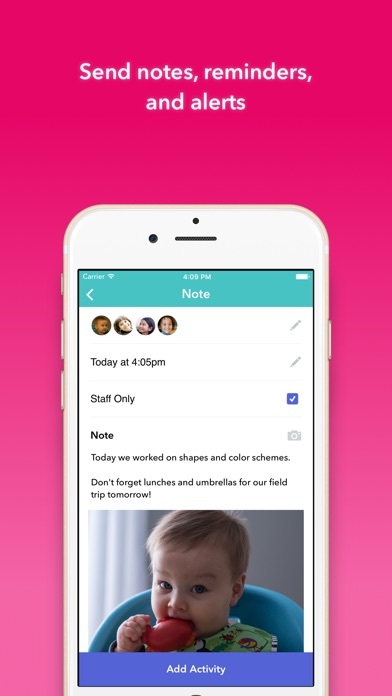 SCHOOLS / CHILDCARE / CAMPS: Manage your students and classrooms, track attendance and room ratios, share photos and videos, assess learning milestones, communicate with parents, send paperless invoices and payments, and manage staff. Brightwheel is your all in one preschool and daycare management app! PARENTS: Engage in your child’s day with a real-time feed of photos, videos, reminders, and updates, use brightwheel’s digital check-in to securely sign in and out, pay tuition online, and even invite grandparents, nannies, and friends to join in the fun! Features include: • Central Database: Store everything related to kids and families in one secure place. • Student Check-In: Multiple digital check-in options available including digital signatures, 4 digit check-in codes, and a kiosk mode - all aligned with child care licensing requirements. • Staff Check-In & Ratios: Make administrative tasks easier by managing staff check-in to see your ratios across all your rooms in real time. 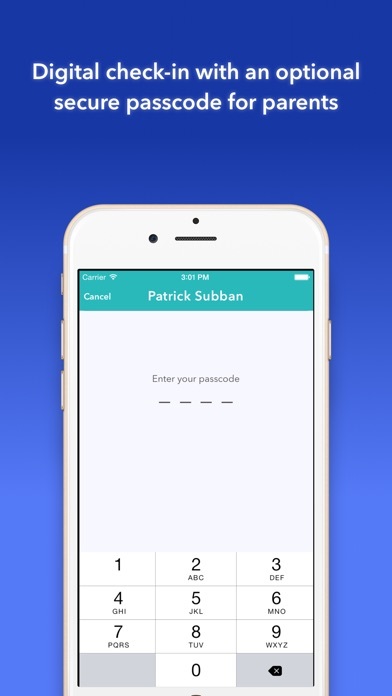 • Attendance: Easily log attendance and absences for your school-age students, infants, and toddlers. Use our attendance tracking system to keep track of your toddlers. 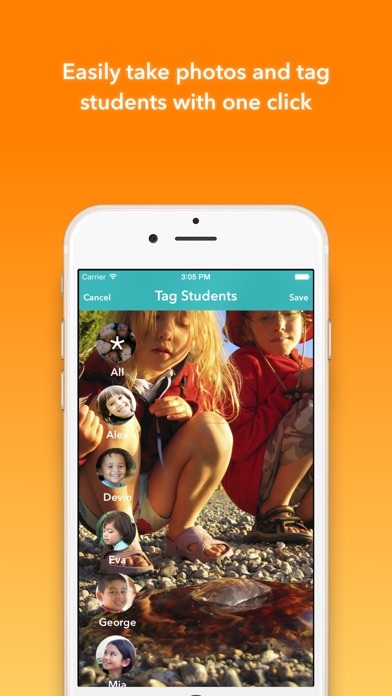 • Photo and video sharing: Snap photos, record videos and tag students with one click. Automatically saved to your account and shared with parents (with no extra work!). • Daily Reports: Log naps, meals, bathroom, and other activities. Parents get a feed and daily summary. Daily sheet reports are a breeze with brightwheel. • Assessment & Observations: Make note of progress, achievements, and activities with pre-loaded state standards and a DRDP tool. Share with parents or privately amongst teachers. 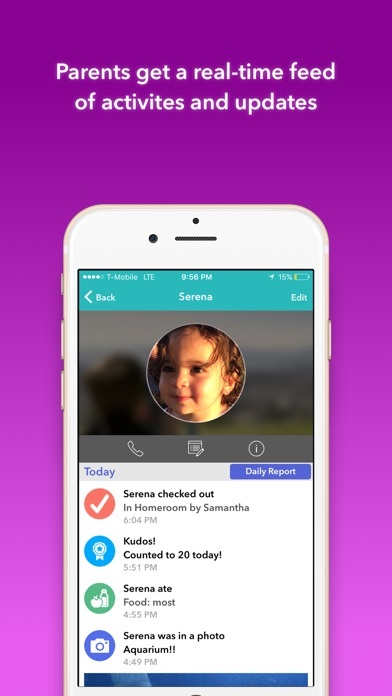 • Student Feed: Parents get a personalized feed throughout the day. Save time – no more paper tracking sheets or sending individual photos. • Parent Communication: Manage parent communication from one central hub (notices, calls, texts, etc.). • Calendar: Share events, holidays, and important dates with both families and staff. • Paperless Billing: Seamless electronic billing and payments for tuition and fees. Use brightwheel for all your child care accounting needs. • Reporting: Detailed reports of every brightwheel feature for billing and licensing requirements. • Seamless Sync: Brightwheel stays up to date across all phones and tablets – so teachers can use their own device or a school device. • Web Portal: Easy management and great functionality available on the web, too. • Affordable. Both free and premium plans available to fit your needs. And... much more coming! Brightwheel is the early education platform that is committed to innovation with frequent improvements and new features. I got texts spamming me over and over again to download the app. So I did just so I can rate it 1. I don’t know you or know how you got my information to be spammed. Recent update forces users to enable read access to photos in order to download photos and videos. This was not the case with prior versions. This change is not welcome and not warranted. Please return prior write only access as soon as possible. I love having the ability to see any time of day how my kids are doing! I do wish there was a way to have a conversation with the director that is not visible to the rest of the staff. So we can talk about payments or other need to know subjects. Brightwheel is, by far, superior to other childcare management programs. One thing that makes it stand out above the rest is their willingness to listen to customer feedback. They are constantly evolving and making the app and website better. Now that the folks at Brightwheel showed me how to filer what kind of notifications I get, I love it! This app is seriously awesome! It has all the features you can think of. This app is such an amazing product and allows us to be much more involved in our son’s day! We get updates and pictures throughout his day and can engage him better at home since we know what they are learning about at school. The teachers all say how much they love the functionality and ease of getting us info. I love this so much; it makes our lives as working-parents so much more fulfilling. I love how I can do billing, check-in, and communicate with parents in one place. I’m not sure what I did before I started using brightwheel. Highly recommend!! As a parent, this app is absolutely fantastic. To be able to have this kind of visibility into my child’s day is absolutely priceless. Not being able to be with my son during the day is tough, but this app really goes a long way to bridge that gap. I own and operate a small preschool in South Carolina. From our opening 5 years ago, we incorporated many different apps and ideas in order to communicate with our parents and keep them connected to their children. Brightwheel by far has been the best tool for this! We have never had an issue using Brightwheel in our three years of use. Parents rave about this app and many have actually said they chose our preschool over others because of the app. The value it adds to our staff’s day (making communication a breeze) and to our parents’ days (seeing their little ones when they can’t be with them) is priceless. As a camp counselor, brightwheel makes it easy to spend more time doing my job (giving kids an enjoyable, educational summer) and less time in an office doing paperwork. I save so much time by being able to log activities and then put my phone away and focus on my job. Plus, I know what happened with my campers the day before when other counselors tracked activities. The support team has been great, it’s easy to use, and the price is great for what you get. Love you, brightwheel! brightwheel is awesome and helps so many of my teachers and admins solve problems everyday. Keep it up! A thoughtfully designed application for directors, teachers, and families. It is easy to use and intuitive. It helps solve the more complicated aspects of running a childcare center, teaching and tracking within the classroom, maintaining records and reports, and truly helps families and staff work together to help little ones develop and grow. On top of all of that their team listens to feedback in order to build new features that keep their platform evolving and relevant. My wife and I have been on the daycare search, as we will be having our first child soon, and love seeing how many programs are using brightwheel. With many friends being new parents, they’ve talked at length about the peace of mind it has given them when they had to go back to work, and it’s a must-have for us in our search. Thanks for all you do brightwheel! This app is incredible. Early Education Centers can save an amazing amount of time by using brightwheel. Check in/out is a breeze. Parents love the communication, pictures, and videos of their kiddos. Being able to pull daily reports with a couple clicks and at real time is awesome! Love that I can do check in, parent communication and billing all in one place! I’m a daycare and preschool owner and also have a child in grade school (which uses a different app). I LOVE Brightwheel and wish my daughters school will switch over. Brightwheel is a time-saver on the admin side, an added bonus on the parent-side, and great tool for the teacher side. Teachers use it to update parents and track children’s progress. Parents rave about it and are always “in the know” of their child’s day, making pick up seamless. When we give tours, we always mention that we use Brightwheel and potential clients are in awe when they learn about what this app can do. I also have a little one at my preschool and use this app on the Parent-end. Look no further... coming from someone that uses it on back and front end, and also have experience with other school apps, this is it!! Brightwheel is an efficient way to manage every aspect of your childcare business. Parents love catching a glimpse of their child’s day, messaging teachers and the easy of paying tuition. Staff members record their time worked, message parents, build lesson plans and document attendance. This time saving, convenient app is an administrators dream come true! Download it today. As a child care director We have been using brightwheel for two years now and it has been a godsend! It helps communication with our families and has made our families feel more connected to the center and their children’s childcare experience. I highly recommend this app! App was great until they recently changed the way to scroll down the screen. Previously, you can touch anywhere on the screen to scroll down but with recent change or update to the app, if you touch a picture or video it will take you to the picture or video and cannot scroll down/up. This is very annoying, please bring back the old better brightwheel! In general I love this app, however a recent update made scrolling a feed very difficult because one can no longer swipe/scroll when a picture is touched first. It is as if the app can’t tell the difference between swipe and tap actions. When a photo takes up a large portion of the screen, as it often does, users must find that sliver of header to scroll. Rapid scrolling near impossible because you are bound to touch a picture which then halts the scrolling. Please fix. A recent build introduced a pretty major UX issue. When scrolling the app thinks you want to view a photo/video. This then requires you to find the white areas of the screen that aren’t photos to be able to scroll. Also I find it terribly annoying that photos and videos are not automatically saved to an album on your device requiring you to download them individually. Saving photos is also a different interaction than videos. Great app initially but no longer getting ANY notifications on my iPhone. This is very frustrating as staff will send time sensitive messages that I am no longer alerted to. No longer getting check-in/out notifications either. It’s a great app but there could be some more basic enhancements to increase user experience like download all photos (give a filter option as well) because currently we have to go to each photo and download one by one. I love this app and would highly recommend for any daycare. It's everything you need and more. As a director of a very busy daycare I could not survive without it. The invoicing and payment part of this app has saved me hours and hours of time. They make improvements regularly and it just keeps getting better. You will not be disappointed! I absolutely love what it has done for my preschool. I currently use the check in feature, daily report, billing and photo/video updates. Many of my parents have recently relocated so it allows family from back home to be updated on their child. I love the message all parent feature which has allowed me to go GREEN and save paper. I have no idea if it has to do with my phone but I installed the latest update and ever since I haven’t been getting notified of my child’s check in/outs nor have they been appearing in his “feed”! Please address this issue or contact me to fix this thanks! I’ve used a bunch of different apps for my daycare and this is by far, the best one out there! It’s not only super easy to use, it has tons of features too! And the customs support is quick and friendly. Definitely recommend! Great app. I have some suggestions. 1) If I only have one child in the app, automatically take me to that child’s feed so I don’t have to tap on them. 2) If a photo or message is posted, show a badge on the app icon on the home screen. Only those two events though. 3) Allow parents to heart a photo. I used to love this app and rave about it to anyone who would listen! Now the check-in and check-out feature has been disabled and it is causing confusion and frustration. Many families have two working parents and it’s helpful for us to know when one parent has dropped off or picked up our child! Bring it back ASAP!! Until this app allows us to select which childcare events we need to be alerted for I am put in a position of either turning off notifications because 90% of the time they worthless (yay my toddler peed. Again.) and miss the important communications that matter or I look keep them on and have my phone/watch going off every time some meaningless thing happens that we don’t need to track. I will update this review if and when the ability to select which notifications are important to each user is implemented. Would love to see an update which would allow the parents to choose what notifications to receive. I love seeing the pictures/videos and the important notes and incident reports. I’d rather not be notified every time they potty, snack, etc. I really love this app. I’m a first time mom and my daycare send me photos, updates, videos of my baby and I am so glad because I hate being apart from her. I would suggest to make it apple watch friendly...maybe someday?? ?😁 I would even appreciate this app more if the messages were accessible on a desktop and not just the app. Love it though!!! I am super satisfied with Brightwheel. The app is easy to use, great for family engagement, excellent communication and record keeping tool. Their team support is amazing and respond promptly to questions. I will be using in all of my centers. I can’t say enough good things about this app! This app has been a time saver for both staff and parents when communicating and sharing daily information about each child. SOOOOO MANY pics or videos that the teachers have uploaded have been saved by parents and then posted on parents Facebook page. ILOVE the lesson plan option. I can review from home when I want to remember what the upcoming lesson will be or to share w/others if I’m out sick or on vacation. As a parent using the app, I love getting the real time notifications regarding my child’s day. I do wish there was a way for me to like or acknowledge that I’ve seen the posted pics or notes without writing them a message. The teachers have no way of knowing that their hard work posting everything is actually getting checked by the parents. Big issue for me. Fix that and my rating moves to a 5. I love seeing pics and hearing updates about my little “bugs” day! Especially love the pics of her sweet little sleeping face while she is napping..... all tuckered our! Thank you from Layla’s Nonna. .
Really keeps you connected with your child and makes daycare easier. This is the best thing ever! To know what my boys are doing all day is priceless. I enjoy it but wish we could send pictures to the staff to show them a type of position or medication for my child. My son has Down syndrome and need extra communication. Brightwheel is a great app our babysitter uses to keep us up to date w our son’s day! I travel for work and feel like I’m still a part of my son’s day and growth! Our babysitter normally loads two photos a day which is awesome! If you’re in this field I highly recommend it as a tool to keep your parents included. 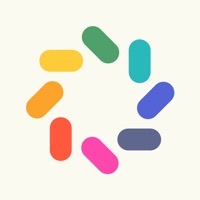 Brightwheel is an amazing tool that allows parents to feel apart of their child’s day and alleviates some of the “working mom woes.” I love being able to open my app anytime and see what my son ate for lunch, how long he took a nap for, and most days a picture or video is waiting for me to show me his daily activities. I can easily pay tuition now as well instead of trying to remember to bring my checkbook once a week. No complaints! Id give it 6 stars if I could! I can’t imagine having my kid at any other daycare that doesn’t have Brightwheel. This app makes me feel so much better because I can see the updates on him everyday. Pictures, notes, what he ate etc all important to keep up on his day to day milestones and well being. I love that I can pay right through the app as well. I wish you could do split payments like two cards or two accounts but I still love it.